The Aigburth Manor Association thanks Councilman David Marks for working to complete this project. Delegate Steve Lafferty and state Senator Jim Brochin helped by obtaining state funds to assist in demolition of the existing greenhouses. 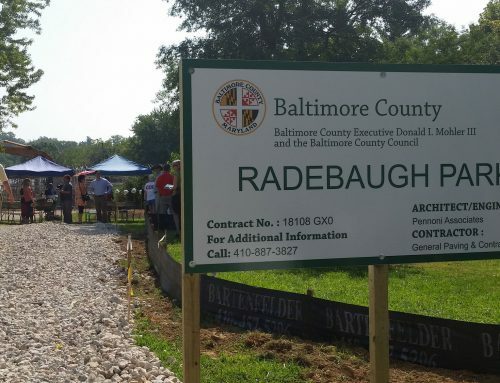 I am pleased to report that Baltimore County has completed negotiations with the Radebaugh family and the County Council will vote soon on approval of a contract to purchase the property. Many people were involved in this effort, and I would like to thank those individuals ignored in the County Executive’s press release: Senator Jim Brochin, the hard working volunteers of the Green Towson Alliance, Towson’s neighborhood leaders, and the members of the County Council who stood with me when this deal seemed to be on the verge of collapsing. This was a unified, bipartisan effort that will produce Towson’s first new park in two decades. County Executive Kevin Kamenetz’ press release.